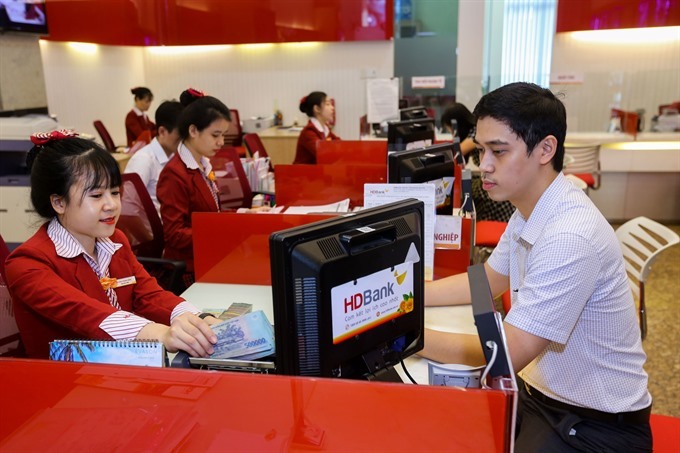 HCM CITY— Moody’s Investors Service has upgraded the long-term local and foreign-currency deposit and issuer ratings for the Hồ Chí Minh City Development Joint Stock Commercial Bank (HDBank) to B1. The baseline credit assessment (BCA) rate has gone up one level. The lender’s long-term counterparty risk rating (CRR) and counterparty risk assessments (CRA) have still kept at B1. This upgrade from Moody’s reflects HDBank’s big improvements in capacity, capital and profits. The lender announced pre-tax profits in the first nine months of this year rose 50.8 per cent year-on-year to nearly VNĐ2.9 trillion (US$128.2 million). This represents 73.3 per cent of its full-year profit target. The bank has sustained its return on equity ratio at 20.1 per cent. Its capital adequacy ratio (CAR) has reached 13.6 per cent while non-performing loans are 1 per cent. HDBank’s total assets had reached VNĐ199.38 trillion (US$8.5 billion) and its equity capital was nearly VNĐ16 trillion. Its charter capital reached VNĐ9,810 billion.